After Might and Magic Book One, I wanted something light. Offspring Fling fit the bill nicely. It’s cheerful and colorful, short and not too hard on the noggin, though it is a puzzle game at heart. In fact, it was so fun for me that I managed to beat all 100 levels in one day (or about 4 hours). Let’s get that out of the way. As I said, I beat all 100 levels. Out of those 100, I got gold or better in 75 levels, and four of those actually got the rainbow flower. As soon as I was done, I also beat a few of the early levels again to earn the gold flower, which got me to 80 gold flowers total. So, I have 80/100 gold flowers and obtaining all of them seems pretty reachable. I also have 4/100 rainbow flowers and at this point, I’m not at all hopeful about getting all of those. All of that got me 51,5% completion of the game. Of course, in my blog, this sort of completion counts as 100% Completed, which is a whole separate category to just Completed. For now, Offspring Fling is Completed. Will it ever be 100% Completed? Probably not. I do, however, intend to aim for the gold. 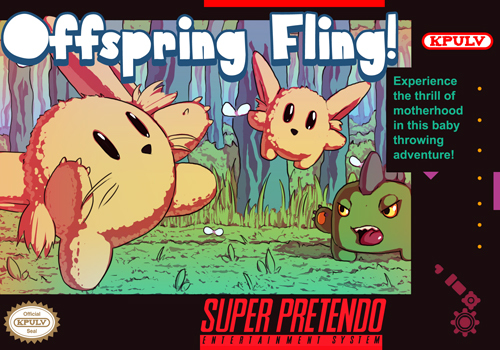 Offspring Fling is a platforming puzzle game with the aim to aesthetically emulate old SNES games, all the way to the fake box art the game is marketing with. 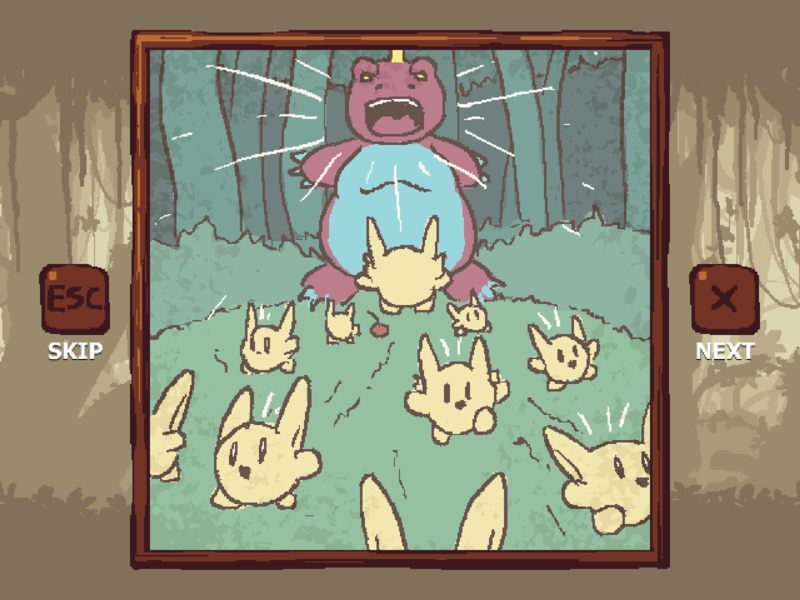 The plot is that you’re a mom with a lot of babies and some weird monster things scares off your babies while knocking you out. You wake up and now you have to find your babies. 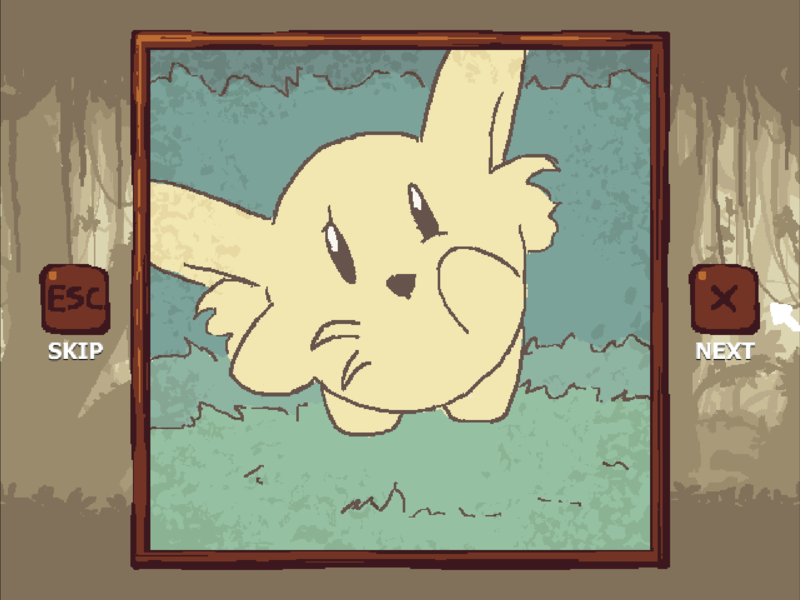 The plot is told in a cute slideshow at the start and the end of the game. 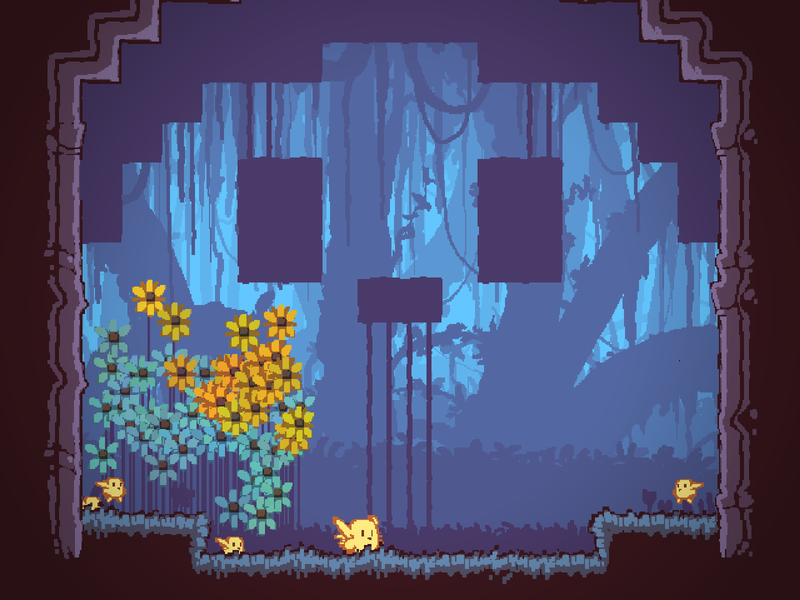 Most levels are single screen, though some stretch a bit further. Your goal on each level is to find your babies and carry them into the exit. The thing is, they usually aren’t in very convenient spots. 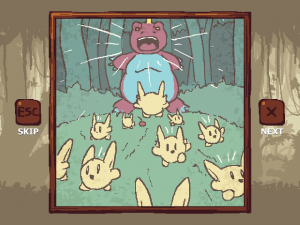 You can carry up to four of them at a time, but with each additional offspring, it gets harder to move and jump around, so your goal is to figure out how to fling, drop and move your babies to get all of them to the exit, all the while avoiding natural obstacles and monsters. 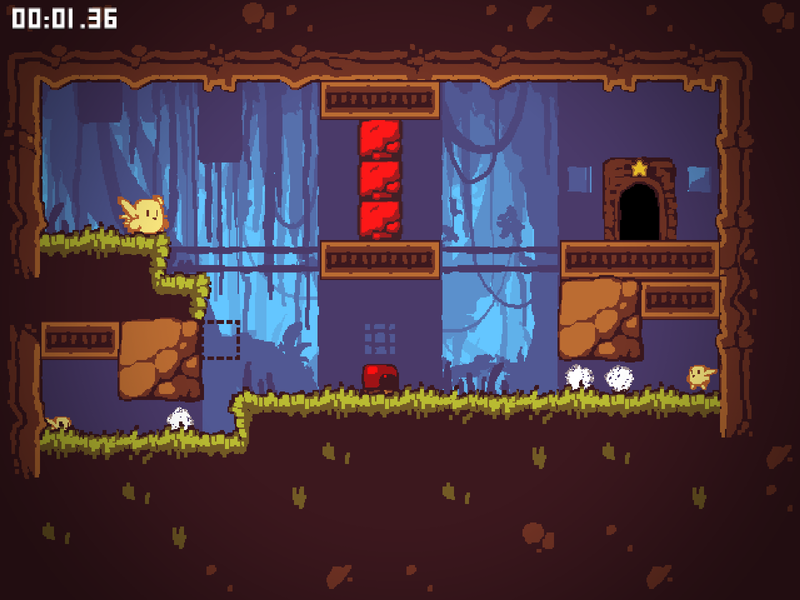 This is a typical early level. You need to figure out the fastest order to get the chicks out and get them through the door. Each level also has a gold time, which gets you the Gold Flower, as well as an even more difficult developer time, which gets you the Rainbow Flower. A Gold Flower is realistically obtainable, most of the time. On Steam, the game supports badges and cards and boasts a total of 10 achievements. I only unlocked three of those after completing the game, so if that’s how you want to get to 100% Completion, it won’t be easy. As I said, Offspring Fling is relatively short, but the point is to repeat the levels in order to master them and finish them as fast as possible. 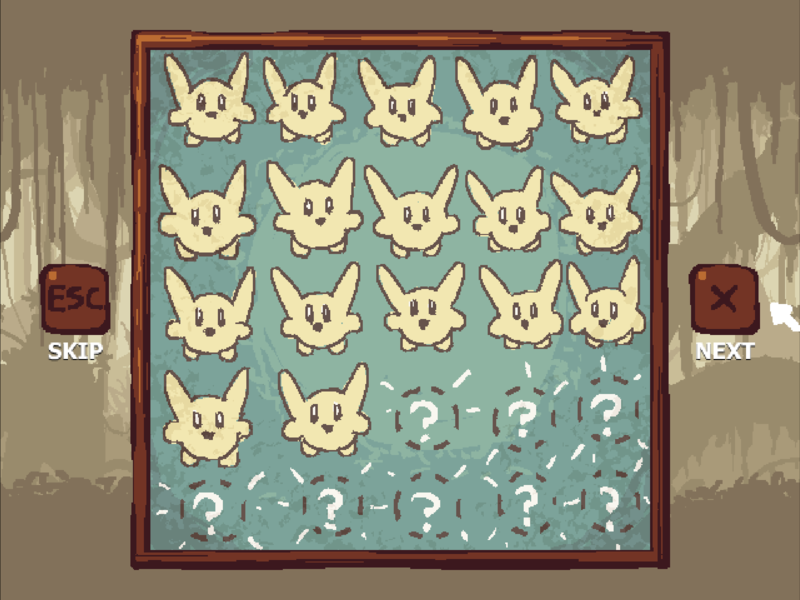 Basically, the game is a puzzle at first, but once you figure out the solution, it’s mostly about executing it perfectly. There are exceptions, though. Some levels require you to find an alternate, not as obvious solution in order to break record time. Offspring Fling is annoying and not very good. This was my thought for the first fifteen or so levels. The controls felt stiff, the solutions were too simple and there was almost no danger to the level. Basically, I didn’t find the game very fun, but I decided to stick with it, because I thought it must be extremely short, based on the level list I had. After a while, I figured out I can pick up multiple babies. In hindsight, the level design did try to show me this, but I wasn’t interested, so I wasn’t paying enough attention. This realization made the game slightly less annoying. Hey! I guess Offspring Fling isn’t that bad! 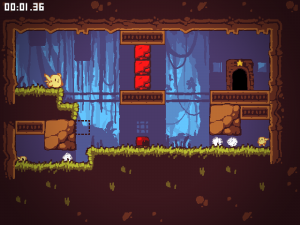 This thought slowly started to set in around level 15, but gained a lot more ground around level 30 or so. I got used to the controls and I realized that, while they aren’t very precise, they do work well with muscle memory. I started repeating levels at this point, because I realized the Gold Flower wasn’t as unobtainable as I though and I actually do want to collect them. You can see all your flowers and chicks in your garden. Basically, I started to get hooked, and it was only getting worse. At this point, I was about 2 hours in, but my nephew got interested to, so I let him play for a while from level one. He actually managed to get a few gold flowers I skipped on my first run because, well, he apparently has an easier time figuring it out, even though he’s six and I’m 26. After about an hour, he had enough and I had to satisfy my itch for more. Yup, I was now hooked. Actually, Offspring Fling is an excellent game. Thinking about it, it has the looks, the music and the humor, so aesthetically, it’s close to perfect. 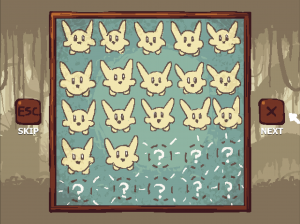 The puzzles make you think, but it’s not slow and methodical. You need reflexes as much, if not more than you need your brain. This, for me, is absolutely great, because It wasn’t mentally as demanding as I thought it would be, but it was demanding enough not to feel like a waste of time for me. There’s actually a boss battle, but it plays mostly like a skill-focused level. The boss battle doesn’t take too long. Basically, I did everything any good mother would do to save her babies after putting them in harm’s way. As much as I would like to excuse it, I can’t. The controls aren’t responsive enough and it gets frustrating sometimes. Muscle memory simply cannot compensate for it completely, especially when you need precision, such as when you have to jump onto a narrow ledge, or through a narrow crack in the ceiling. You end up moving left and right to hit the correct spot, which wastes your time, which frustrates you because it really wasn’t you who messed up – it was the game. You get a head count at the end, based on how well you did. Still, those moments aren’t too common and they can definitely be forgiven. 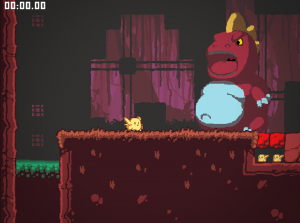 Overall, Offspring Fling is a fun and mostly fair game. There’s one more thing, though. Some of those developer times are simply too perfect. There have been several levels where I did everything perfectly and I’m still 2 milliseconds short. I can even repeat my perfect result as many times as I want, to the millisecond, but I simply have no idea how to do better. I’m not completely sure, but there might be some fourth wall breakage going on here. The game gives you a ghost replay of the developer run when you get close enough, so I know he isn’t doing anything special. He’s just a millisecond or two faster than me. Maybe this is also an issue with the controls. Maybe the game would work better on a gamepad, which I admittedly haven’t tried yet, because I don’t have a decent one available at the moment. 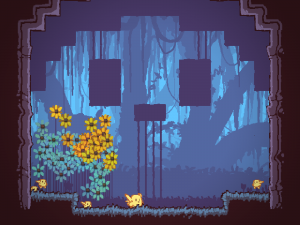 Offspring Fling is a great puzzle platformer, not to heavy on the puzzle, but definitely heavy on the technical skills. It also has charm and atmosphere which not many games have. I recommend it and I’ll be playing it until I at least reach the gold, which I don’t think will take too long. After completing the 100th level, this is where I was. 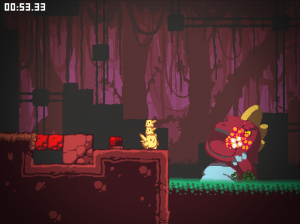 And one more time, I can’t stress this enough – the game looks amazing. It has that washed out color palette and beautiful animations of some of the very best-looking SNES games, except the animations are ever so slightly more detailed, so it actually improves the retro look. Now, the thing is, everything you read up to now was written on the day I played the game for the first time, so I was heavily under the impression. A day later, it seem that the process of being annoyed and then gradually loving Offspring Fling repeats itself. I tried getting a Gold Flower on the level Tight Fit and I was extremely, extremely annoyed. 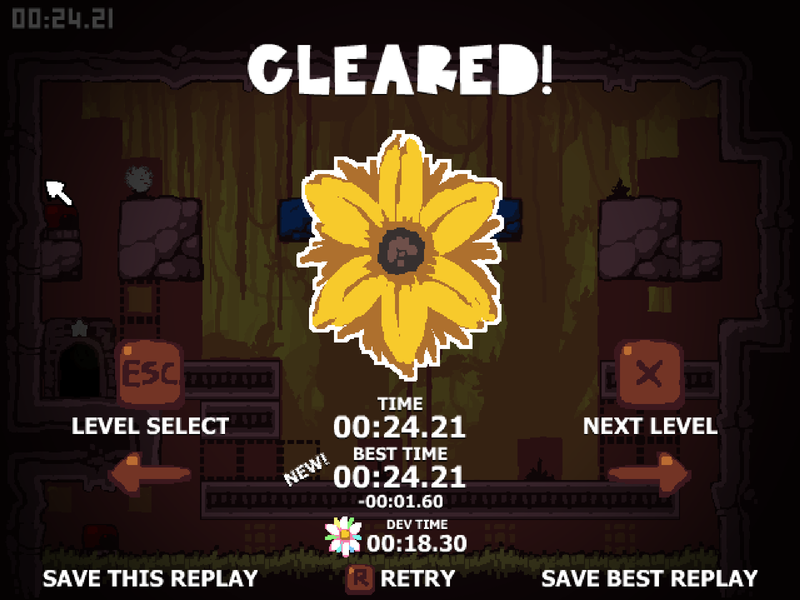 After about 20 minutes of repeating this 16 second level, I got gradually better again and managed to get the Flower. 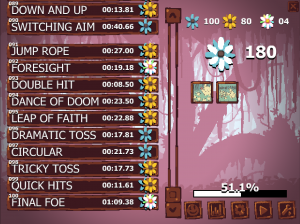 After that, I was in the zone and easily got three more Gold Flowers, and now I love Offspring Fling again. Previous Previous post: Might and Magic Book One  – Game Completed!